According to The Daily Yomiuri, Tokyo construction company, Obayashi Corporation, hopes to construct a space elevator by 2050. 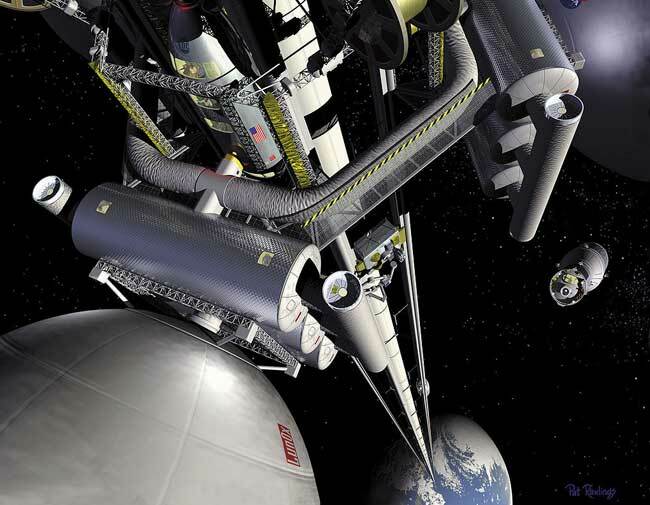 The space lift would carry passengers and cargo along a carbon nanotube ribbon from a terrestrial terminal to a spaceport nearly a quarter of the way to the moon. Sounds crazy right? Here’s how it works: at the end of the 59,652-mile-long, carbon-nanotube cable, there would be a counterweight floating in space and anchoring the assembly connected to the ground terminal. Passengers would travel from Earth to a spaceport equipped with residential facilities located 22,369 miles above the Earth’s surface. No location as been set yet because the assembly would rely on centrifugal force to keep the ribbon taut, so the base would have to be located near the equator. There are still a lot of unanswered questions: what about the different pressures in the atmosphere at different heights? Will it mess with the Earth’s rotation? etc., but it is definitely an interesting and exciting idea for the future!